When it comes to Corsair, we always know we’re going to get a quality product, we just don’t know how high the quality is going to be or what kind of new bar they’re going to set this time compared to the last Corsair Road Warrior gaming chair they had made. The Corsair T1 gaming chair was an absolute winner. Corsair, seemingly inspired by the roaring success of the T1, decided to grab their research team and hunker down for another shot at recreating a masterpiece. The T2 is given an updated body that is less ‘FIA GT’ and more ‘Road sport’. From looks alone, it’s obvious that the T2 is aimed at a more mature crowd who still want a little bit of that racing culture. It certainly looks the part, but will it give you that racing edge like its predecessor did? Let’s see if Corsair has actually managed to outdo the T1 by striving for peak performance or if they’ve gone a little too wide and missed the corner with the Corsair T2 Road Warrior gaming chair. The Corsair T2 Road Warrior gaming chair is another industry standard setter and the whole flow of the chair is a little bit different than we’re used to seeing as well. Something we don’t commonly see is the more narrow body to head ratio on these chairs and it’s kind of refreshing to see one honestly. How does the Corsair Road Warrior chair hold up to its competition and does Corsair have a chance in the world of PC gaming chairs? The design of Corsair T2 Road Warrior isn’t as blatant or as obvious as some other gaming chairs out on the market as the design of this chair is complemented by the narrow long base. Most chairs have curves or try to be shaped much like an hourglass but we’re glad to see something trying to break out of the meta and do something different, not just go with the flow. This is a pretty unique design and the color scheme can be changed but for the most part, the colors are pretty bland. The seam stitching job seems well done but there’s nothing too special about that. Wide base chairs often come with great durability as they have the capacity to support more weight than usual and there’s not usually any problems when it comes to maximum capacity or worrying about wear and tear on the chair due to being overused. the Corsair Road Warrior chair is solid and you won’t have to worry about the overall durability of the chair. It comes with an extremely strong skeleton steel type infrastructure that runs all way up to the head of the chair. Steel Construction – The chair is made purely with steel construction material and is guaranteed not to fold or break under any pressure. You can rest assured that no matter how much weight you put on the chair or how long it’s going to be used, the frame of the chair will ultimately be solid. Not only on the base of the chair, but the construction of the back is also made of steel, giving it that added extra durability. Style – The finish of the chair is glossy and finished with high-quality PU leather material. While the overall design is basically some of the same from many of the chairs that we review, it’s the glossy PU leather finish that really lets this chair shine above their competition. While this Corsair Road Warrior chair does find itself with a lot of hand-me-downs from its older sibling (the T1 Road Warrior), it’s got enough character by itself to let it step out of the T1’s shadow. The T2 zeroes in on comfort, making it a priority with levels of dedication that are usually seen on expensive luxury office chairs. While the T1 had bold red accents that ran down the length of its body, the T2 foregoes the loud visuals for something a little more subtle. The most noticeable visual feature is the red racing stripe that runs down a quilted section of the seat, which is hidden almost entirely when you’re seated. Another rather interesting tidbit on the T2 is the 4D armrest paddles. They look like they’re designed after miniature automotive paddle shifters. Smooth Roller Wheels – Thankfully, for those of us who have wood flooring that constantly worries about leaving scuff marks, you don’t have to worry about that with this chair. These wheels were made to last and they were made to roll without leaving any kind of significant markings behind. Similar to rollerblade wheels, they are sturdy, yet soft. Incredibly quiet in addition to being scratch proof, you won't bother anybody downstairs, or even in the same room as you for that matter. Comfort First – The whole design of this chair wasn’t to draw attention to the look of the chair, it was designed to be comfortable for the consumer first and foremost. This is why they’ve created a deep seat design and gave it a tall back, to help relax and stimulate the nerves in your back for ultimate comfort and relaxation. The extra-wide seat is perfect for big and tall gamers that need a little bit of wiggle room in their gaming chair. Cushions made of mesh-like PU leather are comfortable and breathable. if you tend to overheat when sitting in leather chairs, then you will love how cool your back stays in this one. 4D armrests can be adjusted up and down, side to side giving even more room in the seat, tilt to different angles, or be lifted up out of the way. How far does this chair lean back? This Corsair Road Warrior chair can be tilted back up to 180 degrees when it’s fully reclined. You could even take a nap in it when fully reclined. The base is heavy enough to balance the chair and provide rock-solid support when you recline the T2 to its 180-degree recline. It’s actually rather comfortable when you tilt it all the way and kick your feet up on your desk. We do agree that a footstool or something to keep your legs up at a comfortable height is an absolute requirement when you’re using the more extreme recline angles. The waterfall edge on the seat is most accommodating to a more relaxed position, but it still isn’t as comfortable as we’d like it to be. How easy is the chair to assemble? From our experience and the experience of other customers, the chair can be put up in just a few minutes without any assembly tools but it’s a little tricky at the start figuring it out. Make sure you build the chair where you will be using it as it is quite heavy once assembled so moving it to where you will use it could be tricky. 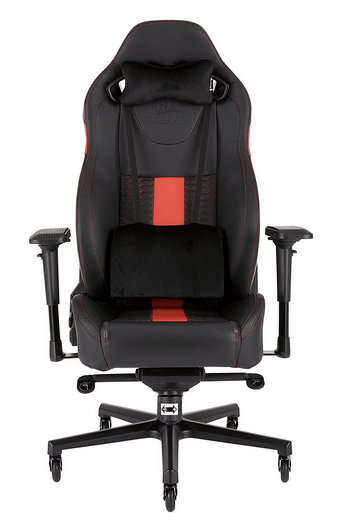 Corsair Road Warrior chair was built for comfort and it shows when you sit down. The Corsair gaming chair is an excellent gaming chair and it’s something that you’ll cherish for a while. This should complete your gaming setup and serve as a great backbone while you game and slay your enemies. We recommend this chair highly and advise you give it a shot. It’s highly customizable and will last you a lifetime. 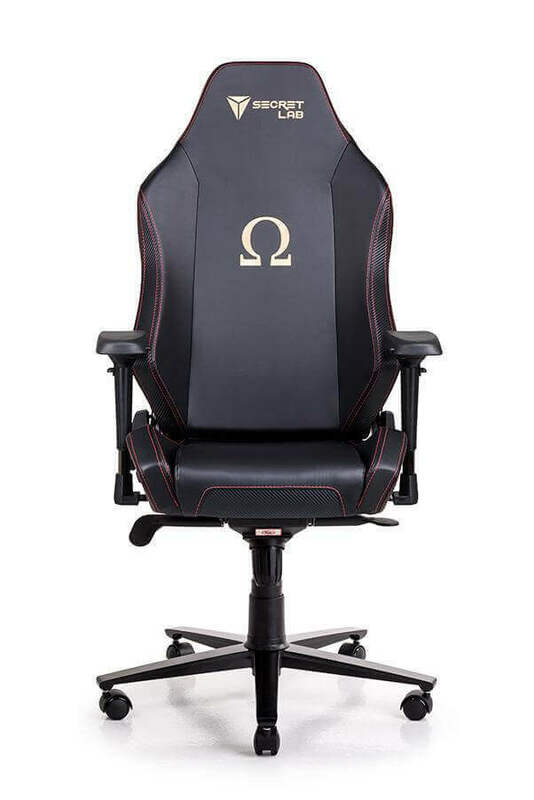 If you are a big and tall gamer, then you will definitely see a lot of value in this gaming chair. It’s got everything you need for a long night of gaming, streaming or working. It looks good as a gaming chair yet you can also have it parked in an office without drawing too much attention from your boss.